You have not suffered until your generator is out of fuel, your car is out of fuel and you are basically stranded. If you can't fuel your generator and nepa no bring light, how you wan iron? how you wan pump water? how you wan microwave food? how you wan even store food for your freezer? In Nigeria we are grounded without power. Whenever people talk about fuel scarcity in the past I look on, because I never had to drive...but with this current scarcity, I hear ween! Last Friday my gauge was already blinking the red light so I parked my car and used a taxi for my activities over the weekend. It was EXPENSIVE! Taxi fare is not cheap, add fuel scarcity to that and it skyrockets. So I decided that nothing will stop me from getting fuel on Sunday, my house is quite a distance from work, I nor fit enter taxi to and fro everyday and I am not in the mood to enter molue or BRT or anything, so I got introduced to blackmarket, 25 litres of fuel cost about 7000 naira, I accepted it with open arms. At least that would serve me for 2 days abi? Early mo-mo on Tuesday I was at the fuel station by 5:30 am...shuo, I dey hurry dey think say na me go first reach there, come and see queue by the time I arrived...Lagosians do not sleep at all. People were gathered in small groups, some abusing Goodluck Jonathan, others arguing about why there should be scarcity in a country where we are blessed with so much oil...another group of men were of the opinion that it was Jonathan's enemies that were causing the scarcity, while others focused on the Boko Haram. Me I was just nodding like agama lizard and looking from group to group...what was on my mind was how to get that fuel. Ehn, as a sharp babe I just begged him that see his big-bellied LASTMA colleague is disturbing my car, what could he do about it? so he said he will stand by my car and make sure I buy fuel before he leaves me...I said OK. The next 45 minutes he spent toasting and I had to be nice, if I nor want make dem tow my car. However, I had an interesting conversation with him, at one point he wanted to be my guy, at another point he begged to be my driver...he said his current salary was 35000 naira, ONLY. I wish I could afford a driver, I for employ am. But I told him, IT IS WELL and prayed he would get better opportunities. By 9:00 am it was finally my turn to buy fuel, I was within TOTAL and they shut the gate behind to contain the crowd: I was sweating profusely, one of the TOTAL managers now said I should shift my car because TVC car wants to buy fuel, I said ok, I moved for them to enter. The next thing I knew, another manager came and asked why my car looked as if it was out of the queue, I explained what happened, he just said, abeg move to the back of the queue. Move what? I should move like 10 cars down? I almost burst into tears. That's like another 1 hour of waiting, e jor oh. I pleaded with this TOTAL manager, he nor gree. I begged the woman in the other car beside me, I was ahead of her previously before I was told to move for the TVC car, I thought she would understand, she just lock up. Instead it was another man that allowed me back on the queue before I could finally buy fuel... God bless him. As I was driving out of TOTAL, one bros just blocked my car with his, wound down and was like "I've been looking at you since early morning, can I get to know you better? "...See this one, you mean you have been here since I've been hustling for over 6 hours to buy fuel, he could not even tell me wa gba petrol? Taaa! Be gone! How are you guys coping with this scarcity? Lol Omg! What an experience!. Nigeria is one stressful country. And all these toasters that will be toasting you but won't even lift a finger to help a damsel in distress. Chei! It is well oh lol. Sisi - I don't envy you at all - Chei see Nigerian? Silly goose didn't want to say 'hello' to you so that he doesnt have to do 'jack' to help you but when you were all done and sorted he decided to put up a 'lets get together act' E jo e ko (no be hin fault). Lol *clutches stomach* and no am not laughing at your predicament. Were ni bobo yen oh. Well am glad you bought fuel. Its been crazy since last week but by thursday it would be over. Ppmc dey work overtime for d case. Can imagine hw fustrated u must hv bn I feel ur pains,anyways sisi dats naija for u o. You had a really full bouquet on the day. Such madness isn't stuff peole should have to go thru [often]. The bigger picture is even more saddening: so much [has been given us], yet so little [do we have to show]. Even we, foot-soldiers, don't show one another any love! 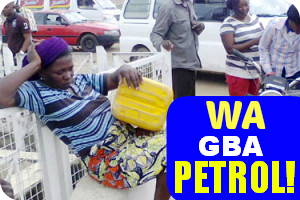 lmaoooo wa gba petrol indeed. every man for himself!! chai e go better. Praise God that you got what you needed sha. This just upsets me so much! Here I am in the states reading this and as a Nigerian abroad I do not understand why we Nigerians settle for this?!?!?! Please o help me understand why we do not march in the streets daily until things are just. Nigeria has too many resources for people to suffer like this o. Look at Venezuela, look at Ukraine when people are unhappy they do something about it until their leaders listen to the people and if they do not they shut the country down. In Nigeria we just live our lives and pray that God will help Nigeria. God can only help those that help themselves and as Nigerians what have we done to change our own lives?!?! We know we deserve much better but what will we do about it and when?!?! Bibi dearie do you think one pessin can make a difference in Nigeria? You see how all the other comments are laughing at Sisi Yemmie's ordeal or saying sorry because she had to go through it. No one seems angered which means people are fine with the way things are going. Until situations like a fuel shortage in an OIL RICH NATION really pisses people off one cannot lead Nigerians. Plus I am a woman and 9ja is DEFINITELY not ready for a female leader. I will continue to pray for my country because that is the only thing we know how to do in times of crisis. @anon u see why nothing is changing? Everyone, including u give excuses! Its more worrisome when people in diaspora give solutions to the problem in Naija they can't follow through. We can't be like the Arab nations or Ukraine or Venezuela becos everyone has the hustling mentality. I am self employed. If I go to a rally against the Govt, I have to shut my biz down. Who will feed my family? That's our mentality. Change won't come until there is a shift in our 'daily bread' and 'hustling' mentality. And also, until the voice of nigerian in diaspora is heard alongside the voice of the ones who haven't yet 'checked out'! God save our nation!!! Which excuse did I give? Nigerians in the diaspora are ready to fight alongside Nigerians in Nigeria. We are just waiting for the call. Nigerians at home have to initiate the movement and we will come when called. So many of us are tired of living overseas but we have grown accustomed to 24 hour electricity, fuel, good roads, good schooling system...that it will be too difficult to move back and deal with the issues Nigeria has. But when Nigerians are ready to make change and change the mentality that you speak of trust me everyone in the diaspora will be there to help. It was a veri rough day 4 u sisyemmie, but in my area AJEGUNLE (lagos) we deal wit black market but its use to knok our generator nd car,wetin man pikin go do. I'm not even thinking about going to get fuel - thank God for Cakes. He filled up my tank on Saturday or Sunday morning. I've finished abusing the leaders of this country and anybody that has anything to do with this mess. This is sooooo bloody annoying. I'm ready to go back to the States because of this crap. ahahahhahaa......sorry sisi for laughing at your predicament because I can relate with the fuel scarcity and lastma palava.....we survived on black market o.
I like your humour.....this is why they say we 9jas are the 2nd most happiest people in the world because we can joke with our predicament....Okey Bakassi proofed that in his open letter. Omo, see toasting levels......ahahaha..you be fine babe so no blame them. I just love your sense of humour, Sisi! Anyone that can turn a frustrating experience into comic relief deserves a medal. As for Naija wahala, l just tire o. We simply can't go on like this. This is the reality of 'returning' to an insane and inhumane climate from a sane and organized one. All this 'return to Naija ' no be moimoi at all. You have a very funny way with words. This brought back a very clear memory of the early days of the economic crisis in Zimbabwe. Queues for bread would wind around buildings and so would fuel queues. I'm glad you managed to get some. as for the guy who had the nerve to throw a line at you after all that..... lmao. the nerve! I am so pissed I do not even find it funny. I am scared for Nigeria and even more of Nigerians , later we ll be screaming for justice on aluu4 and the like. Atleast 5 cars behind you would haveseen you move for the Tvc car, why the sudden pretence? I always pray day in day out for me not to be in postion of help or in need of a witness. Nigerians are evil. We hate intimidate, bully and look down on each other yet we want better leaders. Nigeria wont change till we change. You are right. That lady is plain evil. Geez, I wonder why she could not let the young lady get ahead knowing what happened. Even the average citizens in Naija need help. LMAO!! I'm all late but was funny when you said, "Taa be gone!' Lol...chai Naija...I feel for you though.